Together with University Advancement, OARS has developed a crowdfunding platform specifically designed to engage alumni, family, and friends of Miami University. Through HawksNest, alumni, family, and friends can directly support the research, scholarship, and service projects of Miami University students, faculty, and staff. This is how HawksNest works. Any Miami University student, faculty, or staff member may complete an online application to have a project considered for funding. An internal review team assesses applications and posts approved projects on HawksNest for a maximum of 45 days. Potential donors visit the site to learn about and pledge funds to approved projects. Once a funding goal has been met, the project can begin! Project managers use the site to keep donors up-to-date with information on the project’s progress. Miami faculty, staff, and students can submit projects anytime. We encourage Miami faculty, staff, and students with great ideas that could be implemented for under $6000 to create a HawksNest account and submit the project for review today. Check out our FAQs and project review criteria. And — since crowdfunding is successful only when project managers actively promote their projects — also be sure to check out these tips for using social media to promote your campaign. Ready to get started? 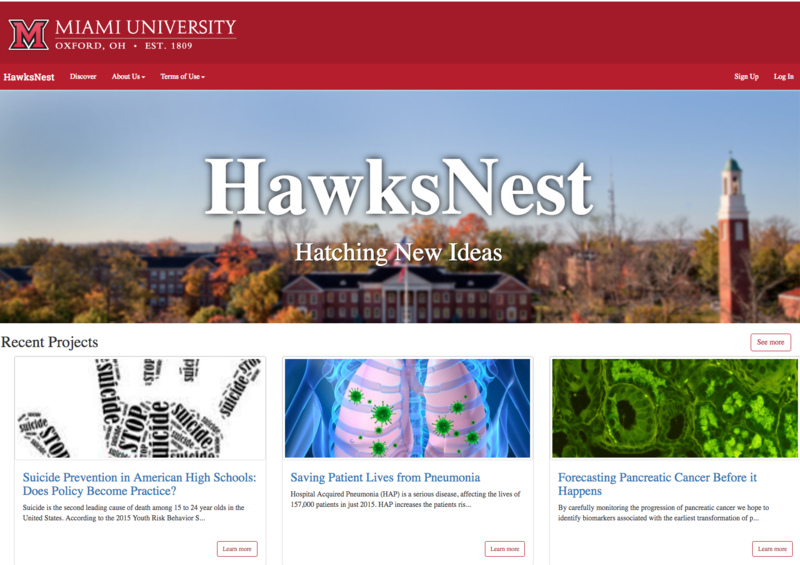 Visit HawksNest.MiamiOH.edu now. Red-tailed hawk photo by Rick Bohn of U.S. Fish & Wildlife Service Moutain-Prairie via Flickr, used under Creative Commons license. This entry was posted in Finding funding, Internal funding support, OARS news and events, Undergraduate research and tagged crowdfunding, faculty, funding, funding opportunities, research, student research. Bookmark the permalink.